I really excited to move to the next step in my venture of helping others in the realm of software engineering with (2) upcoming speaking engagements. I'll be speaking in November at Modern Apps LIVE! as part of the LIVE! 360 conference in Orlando, FL. I'll also be speaking in September at the Orlando .NET User group meeting. Registration for LIVE! 360 in Orlando this fall which runs from November 17-21 is now open. If you have not been to this conference previously, you should really consider attending to get out of the vacuum which is the daily routine and see what's really out there in the world of .NET and related technology development. The conference over the years has done wonders for my career in the way of knowledge gained in addition to helping land me at my current employer Magenic for which I'm truly grateful. The wealth of knowledge and network potential that exists is unparalleled to most other events live or virtual. 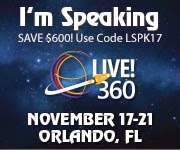 The good news is that if you use the code LSPK17 during registration, you will save $600! Click on the image below to go directly to the site to check out the content and sessions available.